A retaining wall has a couple of different uses. They are sometimes used for structural purposes, such as being constructed along the base of a hill or slope to prevent soil from eroding, which can damage any structures located on top of the hill. Retaining walls are also used in landscaping projects to create different elevations in the yard. When constructing a retaining wall, you can top off the blocks in the wall with capstones, which are used for decorative purposes. Capstones can help to dress up the appearance of a retaining wall. Cut the cornerstone if the wall bends at a 90-degree angle. The capstones generally have three smooth, machine-cut edges and one rough-cut edge that faces out from the wall. Cut a rough edge into one of the sides of the capstone adjacent to the rough side with a guillotine splitter. You can rent the splitter from a stone yard. Cut the capstones if you have a curved wall. Place the first capstone into position on the edge of the wall, followed by the third capstone, leaving a gap between the two that is slightly smaller than the width of a capstone. Place another capstone on top of the first and third stones so that it spans the gap between them. Trace the edges of the second capstone onto the first and third stones. Cut the first and third stones along the line with a diamond blade masonry saw. When you replace the stones, the second stone should fit between the first and third. Repeat this process for the entire wall. 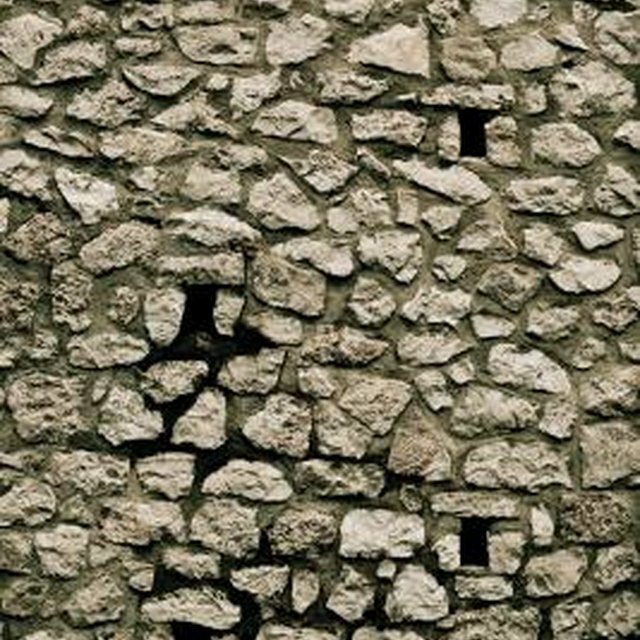 Apply a thick bead of masonry adhesive on top of the stones in the wall in a zig-zag pattern. Place the first capstone on top of the wall, pressing it down into the adhesive. Position the capstone so that it hangs over the edge of the wall by about an inch. Install the rest of the capstones, keeping the front edges lined up. Wear safety goggles and ear protection when cutting the capstones.